as Great Horror Movie Night picks “The Strangers” for their 4th Outdoor Movie Night Event. 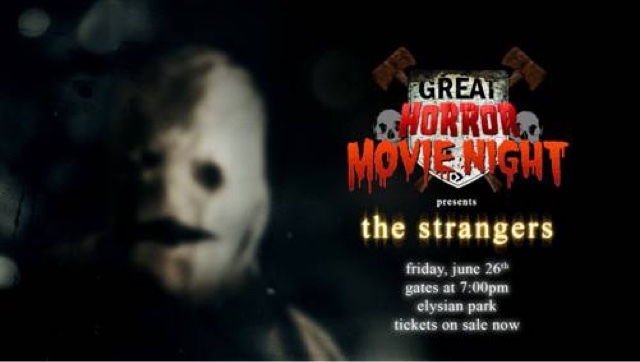 Los Angeles, CA –June 11, 2015– Coined “The Scariest Movie Ever Made,” “The Strangers” will be the featured horror film for the Great Horror Movie Night, taking place on June 26. Under the glow of the moon and stars, perched high above the LA Skyline, horror fans will bring picnic baskets, blankets and chairs and prepare to scream their heads off as producing company Ten Thirty One Productionsadds their own brand of horror by supplementing the onscreen terror with some interactive real life scares taking place off the screen. The night will start with pre-show games and festivities and will be hosted by the Great Horror Campout Headmaster, the overly confident and comedically condescending demeanored mascot of the summer event. Guests are encouraged to pack picnic baskets and blankets and to come early to get into the spirit of being scared. The Great Horror Movie Night takes place June 26th, at Elysian Park. Doors open at 7pm. Tickets are $15 per person and limited in availability. Parking is FREE.